Now that the summer has pretty much come to a close (the weather is confused though…LOL!) 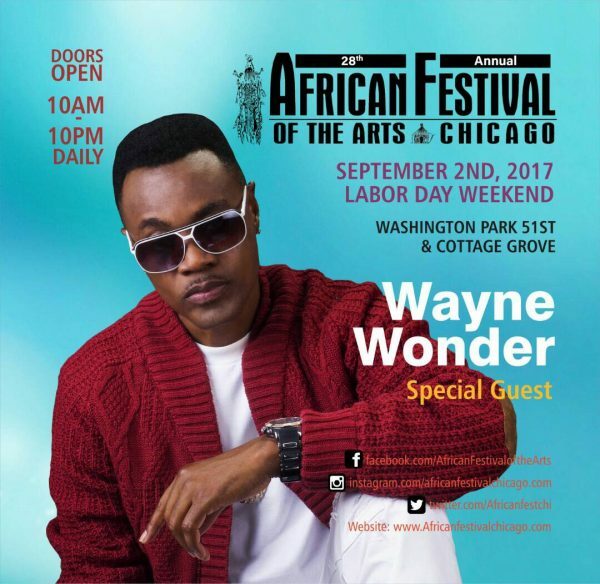 EarHustle411 had the pleasure of covering the 28th Annual African Festival of the Arts held at Chicago’s Washington Park earlier this month. The event was full of fun, food, fashion and definitely an abundance of the African culture. As always the entertainment was on point. With a fully packed 4 days of beginning with the millennials night performance in Friday September 1st by Taylor Bennet (Chance The Rapper’s brother). Day 2 on September 2nd got off to a great start but a severe thunderstorm came along causing attendees to run for cover and thwarted the plans for recording artist Wayne Wonder’s anticipated performance to be rescheduled. September 3rd day 3, the sun returned and dried the remnants of the prior day’s rain and the people returned and filled the park in support of the arts. It was awesome to see the young people showcasing their talents and enjoying themselves Artist Wayne Wonder stayed an extra day and opened for Wyclef Jean and gave a fantastic performance. When Wyclef hit he stage the crowd went wild and showed him just how ChiTown gets down with the Refugee Camp. The last day of the Festival was a day of bringing the soul and funk back to Chicago with the legendary group Heatwave. They took the crowd on a trip in their way back machine and they jammed tunes like Boogie Nights and Groove Line. Heatwave brought the house down and closed out the festival where the food, fun, fashion and entertainment was just what the people needed as they prepared to get their children back in the swing of the school year. We look forward to next year! !